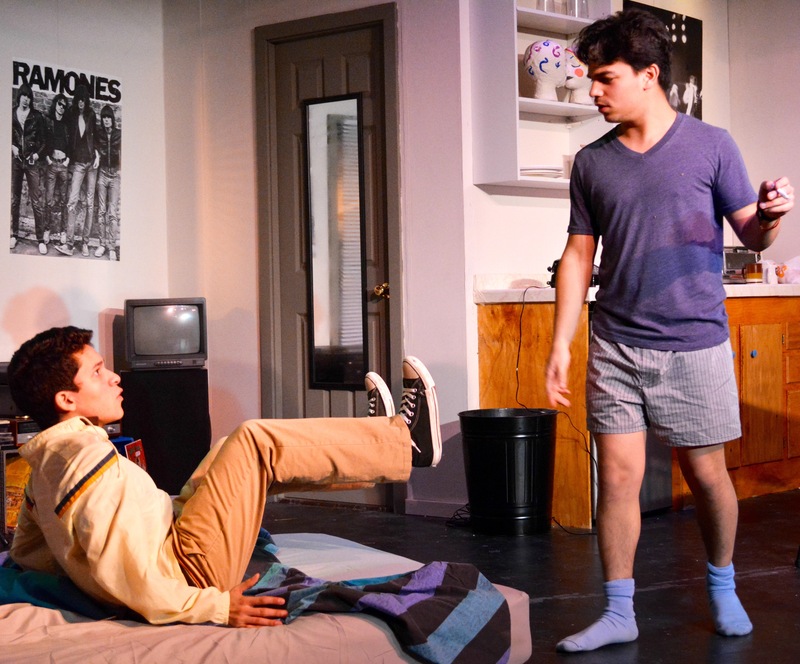 Andrew Pryor-Ramirez (left) as Warren and Fernando Siu as Dennis in the Marin Onstage production of “This Is Our Youth” by Kenneth Lonergan. Photo Credit: Marina Nims. Marin Onstage, performing at the charming old Belrose Theater in San Rafael, turns out to be well worth the trip. And it’s close to a wonderful array of cafes, bistros, and bars on 4th Avenue, as well. On a rainy Saturday night, I ventured over the Richmond Bridge to Marin for the opening night of Kenneth Lonergan’s “This Is Our Youth,” a popular play these days all across the country. Lonergan’s play was first acted and produced in New York in 1996, and then given a powerful remount on Broadway in 2014. It was also produced recently in San Francisco at Custom Made Theater, in October. Once you settle down at a little nightclub style table in the converted old church of the Belrose Theater and have a drink in your hand, you are treated to a realistic stage set of a basic dorm-like 80s New York apartment, inhabited by Dennis Ziegler (Fernando Siu), who is watching some dated crap TV game show, living in adolescent disorder. When the house buzzer rings, he swears at the machine, and reluctantly admits his “friend,” Warren Straub (Andrew Pyror-Ramirez), another shy college-age kid, who is clearly used to being abused and ridiculed by his “buddy,” Dennis. Warren quickly confesses that he has stolen $15,000 cash from his quasi-criminal father—an Upper West Side Jewish businessman. Quick-thinking, exploitive Dennis immediately comes up with a complicated off-the-cuff scheme to buy drugs and resell them to replace that money. Dennis, of course, will make a large profit for himself. Dennis’ comic manipulation of Warren becomes the plot of this 80s “greed is good” scenario. But rather than the killer investors of Wall Street , the movie, Lonergan gives us rejected kids, bottom-dwelling drug-dealing, with disastrous sadomasochistic growing pains. Using a lot of black humor, narcissism, and grotesque twists, Lonergan writes witty characters who keep exposing their painful distortions. Finally, they stand for the destructive forces at work in Reagan’s America, beginning with the 80s. Siu’s Dennis will, no doubt, develop more anger and nasty dominance, in order to justify the willing submission of his admirer. Warren, his hero-worshiper, is played winningly by Pryor-Ramirez. We sympathize with Warren’s plight, and sense the seeds of revolt and insight in him, as he struggles with a rejecting father and a sadistic friend. His speeches and ideas come across as personal and poignant. Pryor-Ramirez finds the questing, hopeful kid in his optimistic portrait. Warren’s potential girlfriend, Jessica Goldman (Bessie Zolno) slyly inserts herself into the apartment, almost like a dancer, for a non-date “date.” Zolno gives us the humor, charm, and self-consciousness of a privileged and troubled college kid. She brings all of Jessica’s family and sexual hang-ups to bear on Warren’s empathetic and gentle psyche. Their dance together in the shabby apartment offers hope and possibilities, as they engage in brilliantly funny and awkward sexual repartee. They create a chemistry onstage that reveals hidden depths in the play. “This Is Our Youth,” by Kenneth Lonergan, plays at the Belrose Theatre through January 30, 2016. For further information, click here. “This Is Our Youth” by Kenneth Lonergan, produced by Marin Onstage. Director: Pat Nims. Lighting: Harrison Moye. Costumes: Marina Nims. Set: Pat Nims + Gary Gonser. Dennis Ziegler: Fernando Siu. Warren Straub: Andrew Pryor-Ramirez. Jessica Goldman: Bessie Zolno. Posted in Reviews.Tagged Andrew Pryor-Ramirez, Barry David Horwitz, Bessie Zolno, Charles Kruger, Fernando Siu, Gary Gonser, Kenneth Lonergan, Marin Onstage, Pat Nims, San Francisco theater reviews, theatrestorm, This Is Our Youth.